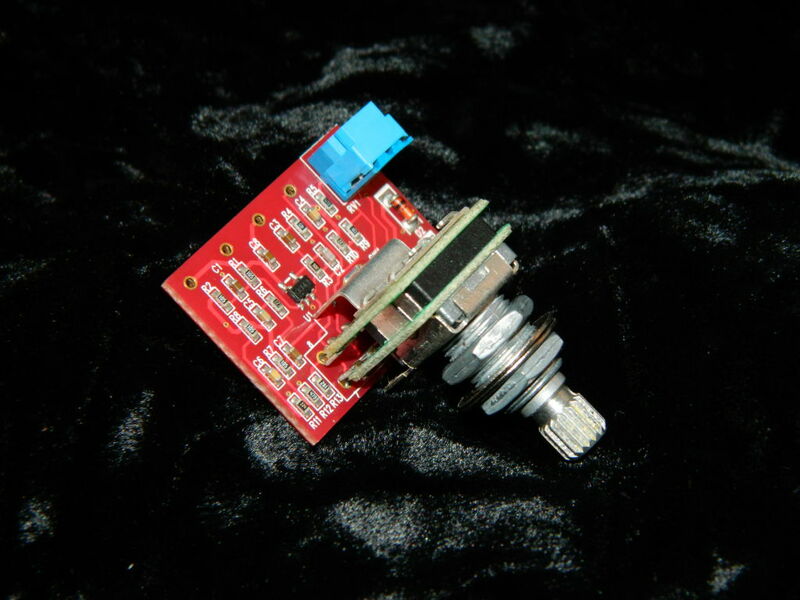 Suitable for use with Ironstone or other pickup system, this guitar pre-amp / multi overdrive effects PCB is designed for on-board guitar installation. 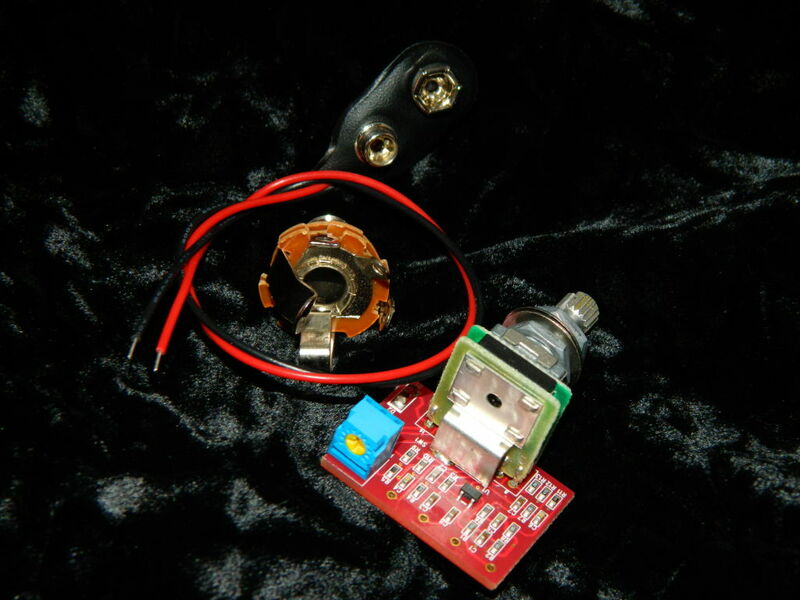 Powered by a standard PP3 9V battery (not supplied) giving between 1000-2000 hours of use, this easy to install pre-amp mounts through a 9mm (approx) diameter body or scratchplate hole. 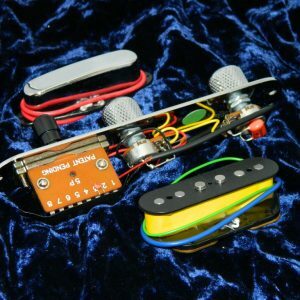 Easy to install with just some basic soldering skill, these little wonders will protect and enhance your guitar’s tone no matter what pickups you use as well as giving you a range of distortion / drive tones at the turn of a knob. 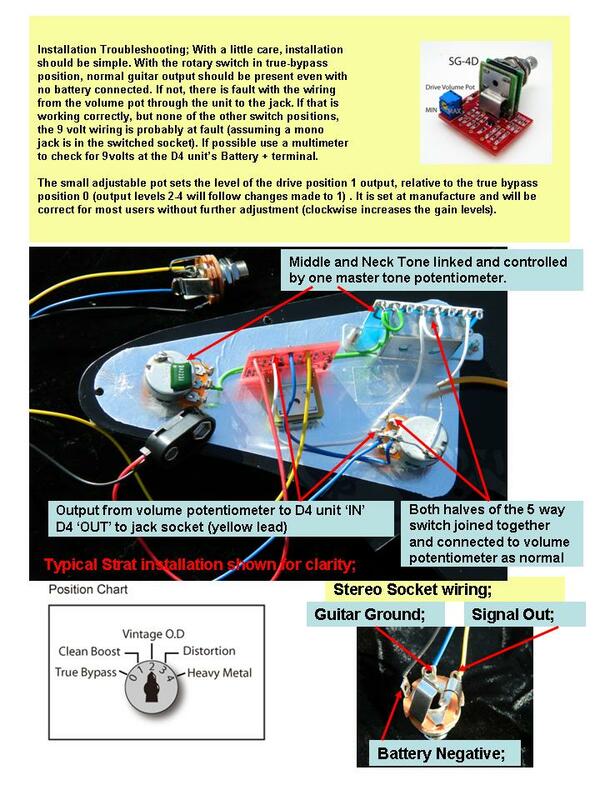 For example, on a Stratocaster style guitar, simply replace one of the tone pots with this rotary switch (using your existing knob) and reconfigure the remaining tone control as a ‘master’ tone – circuit diagram included with each item. 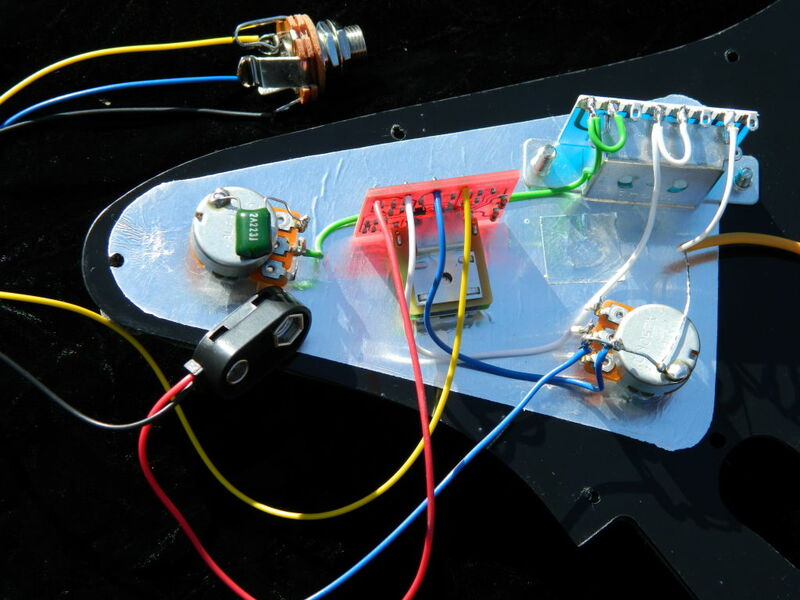 The photos include a typical pre-amp installation for a Stratocaster style guitar, using different coloured wires to give an easy reference and with the unit in place of the Neck tone pot (the remaining tone pot is configured to control the Neck and Middle). All in simple, cost saving protective packaging. Note; It is suggested when switching from passive to active modes (first to second switch position), to first turn down the guitar volume. This will eliminate any small switch over noise. The following sound clips give a sense of the tonal changes stepping through the switch positions. The recordings were made via GarageBand on the ‘Clean Combo’ setting, with tone controls at Bright. No effects are used other than the pre-amp unit. The recording process naturally tends to equalise out some of the gain changes described on the settings above. 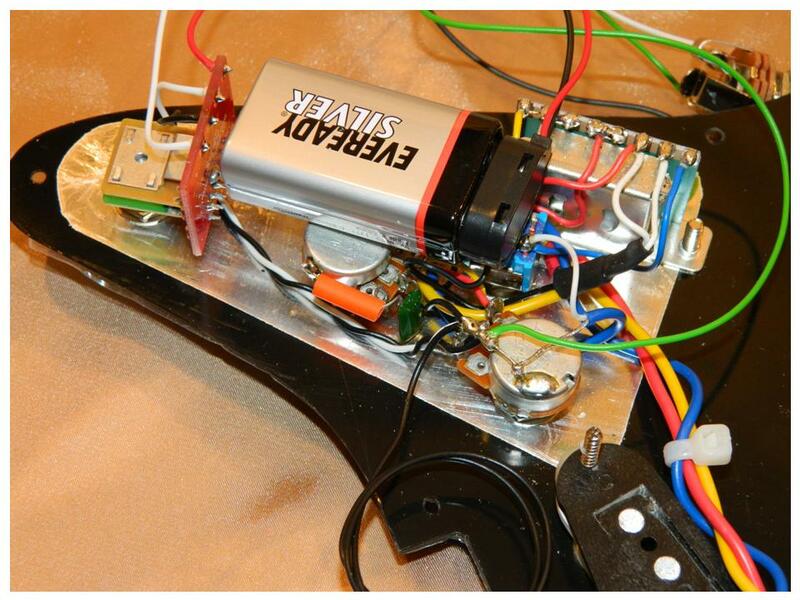 Each clip has 4 ‘quarters’ (of 12 bars), moving from Bridge to Middle to neck and back to Bridge Pickups. And thanks to Robin Thompson for the following YouTube clip, stepping through the pre-amp settings against some well known guitar pieces. 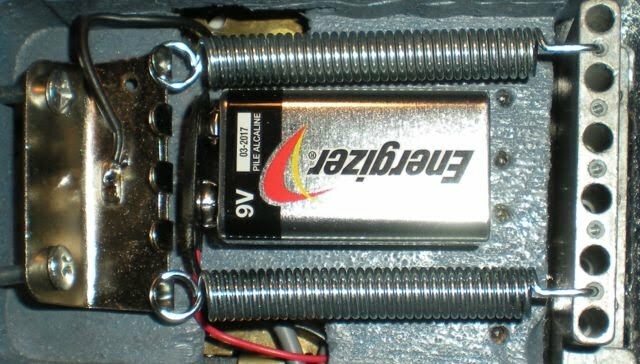 Maybe you like the idea of active electronics in a Strat’ but don’t fancy the idea of burying a battery under the scratchplate? 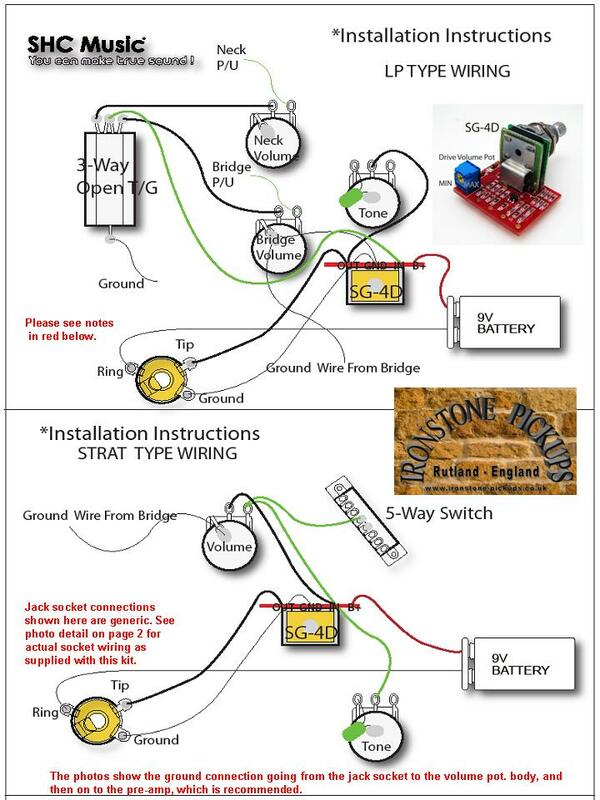 Well check out this neat solution from Ironstone customer Gus Hunnybun. 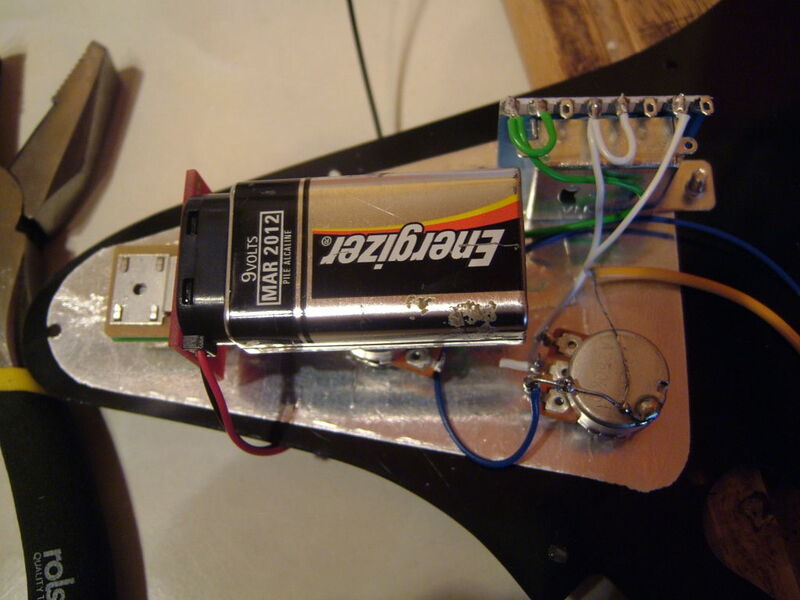 Using 2 springs for the trem., a PP3 battery fits perfectly in a normal Strat’ trem. cavity. A bit of velcro or double sided tape to hold it in place, and some foam for a tight fit under the back plate, this is easy battery change personified! It just needs the battery clip leads to be extended through the normal access hole, or a larger aperture cut as the photo. Worth investing in a robust pair of steel springs rather than the weaker alloy jobs that are often stock, to ensure the whole set-up process keeps integrity. 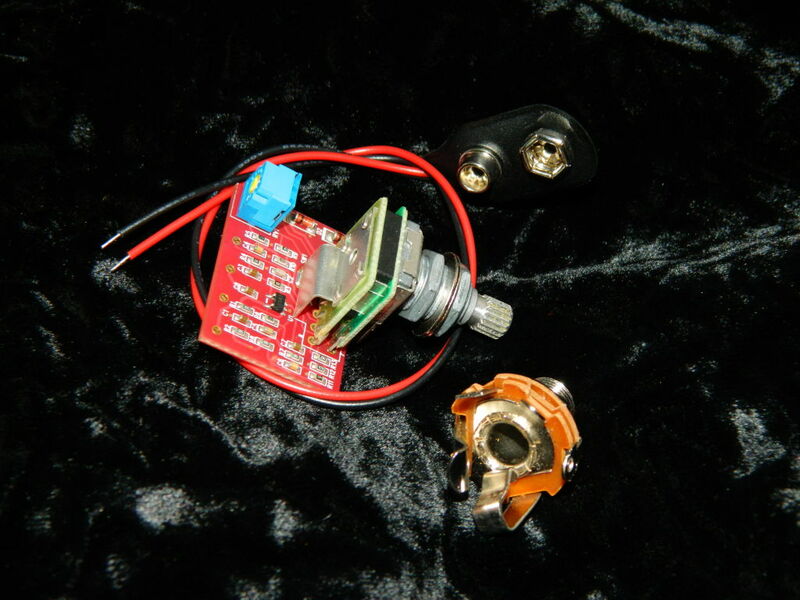 While the gain steps between each setting are fixed, a small user adjustable pot on the device allows tailoring of the gain of position 2 (relative to the true bypass setting). 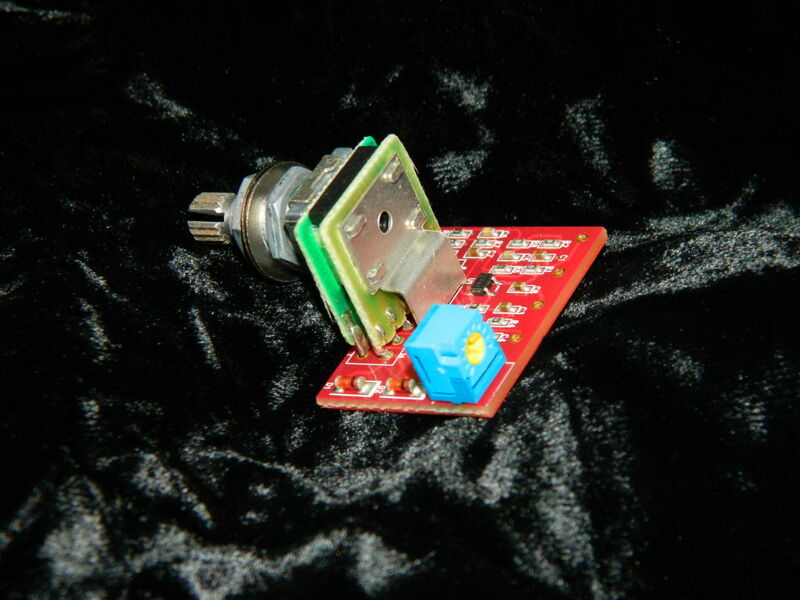 This is initially factory set, allowing the unit to be used ‘out of the box’, but users can alter the position 2 Clean Boost to be at the same level as the bypass, or with a level of initial boost. 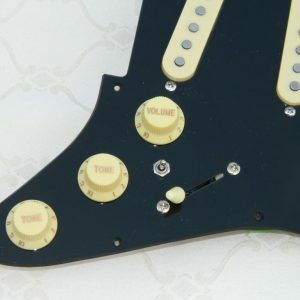 It is suggested when switching from passive to active modes (first to second switch position), to first turn down the guitar volume. 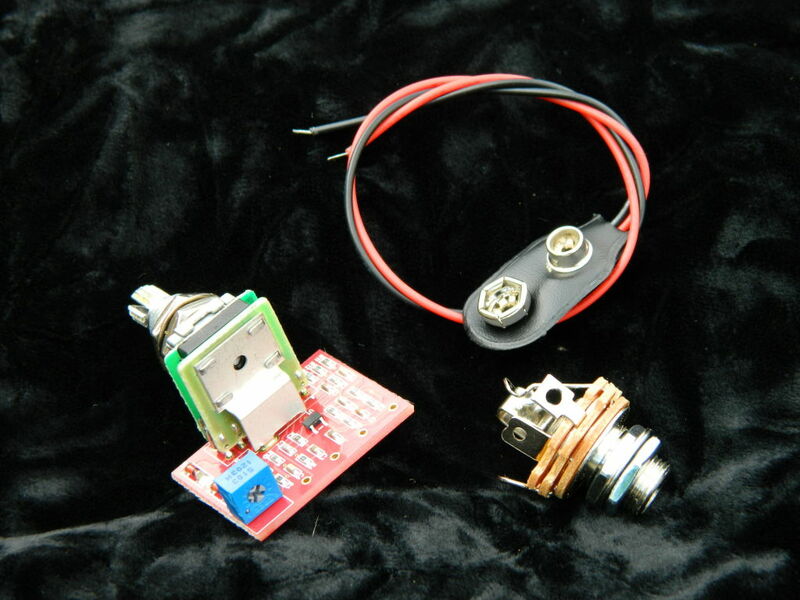 This will eliminate any small switch over noise. 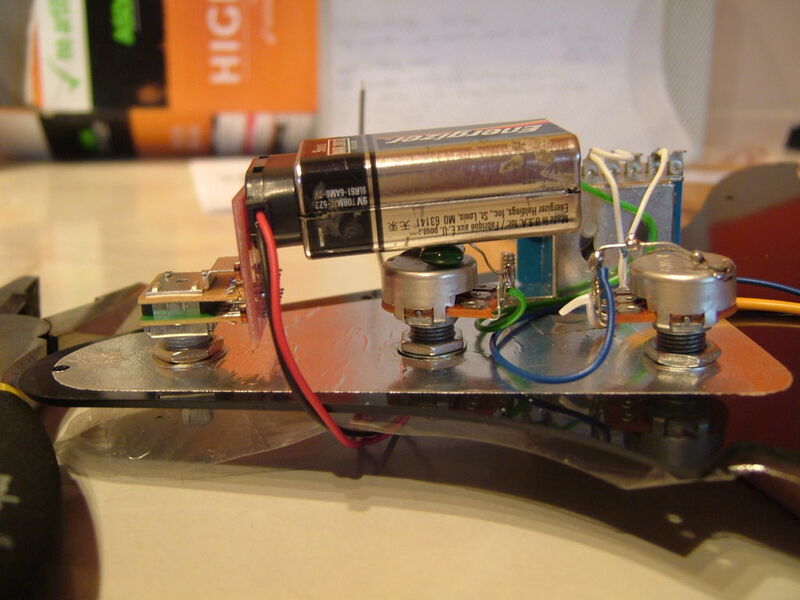 Absolutly rollickinly brilliant preamp that I have fitted to an Epi Les Paul. The overdrives are rich and full and not at all raspy. 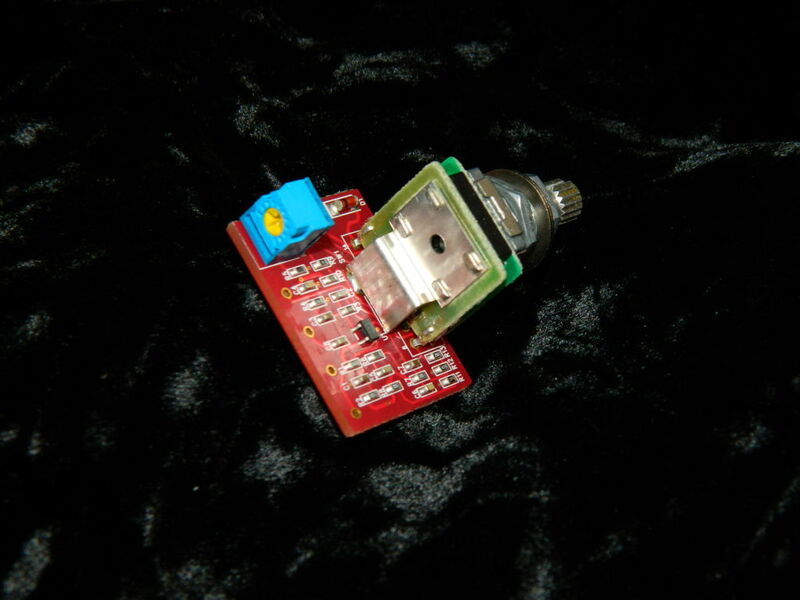 Really decent pre-amp its really useful. And its really small and quite easy to fit. Thank you Tony, All we need now is one that does delay and chorus!!! I think that’s called a stomp box Colin! “This is my second purchase of this amazing piece of kit. My first was fitted to a Parker Dragonfly which I modified (a quad rail humbucker fitted at the bridge)… it has taken a very good guitar and transformed it into an awesome instrument. At first I was a little concerned and anxious about drilling an extra hole into such a pristine top but it was definitely worth the stress! The result is stunning.